Engineer Ian Graham shows Oliver Mundell MSP (L) and James Carsley (R) how tiny fibres are spliced together to deliver FTTP. Dumfriesshire MSP Oliver Mundell was out in the field with Openreach engineers this week (Monday) to see the progress that’s been made with fibre broadband and customer service in Dumfries and Galloway. Engineers also updated him on the company’s plans to roll out the next generation of broadband technology – future-proof, full-fibre services capable of carrying speeds up to 1Gbps*. The MSP visited Dumfries telephone exchange and local fibre street cabinets and learned how engineers are working to identify and fix some faults BEFORE they affect people’s services. He also heard about the challenges and benefits of rolling out more reliable, ultrafast Fibre-to-the-Premises (FTTP) in places like rural Glencaple near Dumfries, with local Openreach engineers Gareth Owens and Kevin Hodgkins explaining the differences between fibre technologies. According to the independent website Think Broadband, 83 per cent of premises in Dumfries and Galloway are now able to connect to broadband at a speed of 30Mbps and above. Mr Mundell said: “I’m regularly contacted by constituents about broadband, so it’s been useful to see today at first hand the progress that’s being made. “Good connectivity is absolutely vital for a strong local economy and, with around one in 10 Dumfries and Galloway households still only able to get a broadband speed of less than 10Mbps, I’m keen to make sure that progress continues at pace. “It was particularly interesting to hear about the next generation of full fibre broadband, where the fibre runs directly to people’s homes, and the huge difference that a reliable connection brings for everyone in the household. Openreach has been working closely with the Scottish and UK Governments, local authorities and other partners to expand fibre broadband beyond commercial boundaries since 2013. The Digital Scotland Superfast Broadband partnership rollout has brought fibre broadband to dozens of communities in the Dumfriesshire constituency, including Annan, Glencaple, Lochmaben, Ecclefechan, Gretna and Amisfield, and includes small deployments of FTTP in areas where it is the best technical solution. 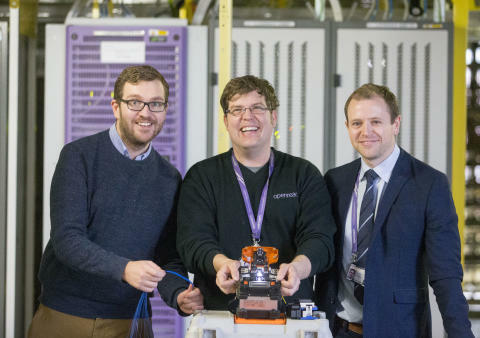 The visit was hosted by James Carsley, project director for Openreach’s fibre network build in Scotland, who said: “We know good, reliable broadband is really important to local people, and we have made great progress, however appreciate that there’s more work to be done. “Oliver Mundell shares our ambition to make sure everybody in Scotland has access to a quality broadband service. We appreciate that he was able to make time to come and learn about the realities of delivering digital technology into rural areas. Openreach’s Fibre-to-the-Cabinet footprint, at speeds of up to 80Mbps*, currently passes more than 2.5 million homes and business premises in Scotland, where take-up of superfast services across all networks stands at around 40 per cent. Openreach is also starting to roll out FTTP more widely, with plans to reach three million homes and businesses across the UK by the end of 2020, and, if the conditions are right, to go significantly beyond. Edinburgh is the first city in Scotland to benefit from its Fibre First investment.